Enjoying plenty of comfortable seating for relaxing & reading under a delightful, hand-painted, vaulted ceiling, the Suite Menta also has a private 110 m2 terrace with exterior furniture from where one can enjoy stunning panoramic views. Suite Farigola (Thyme Suite) has been tastefully decorated in natural tones that contrast beautifully with the exposed stone walls, breathing a romantic, elegant atmosphere. Suite Lavanda (Lavender Suite) is our family / group room comprising two sleeping areas: one with two single beds (which when put together make a Queen size bed) and a second with 2 sets of bunk beds. 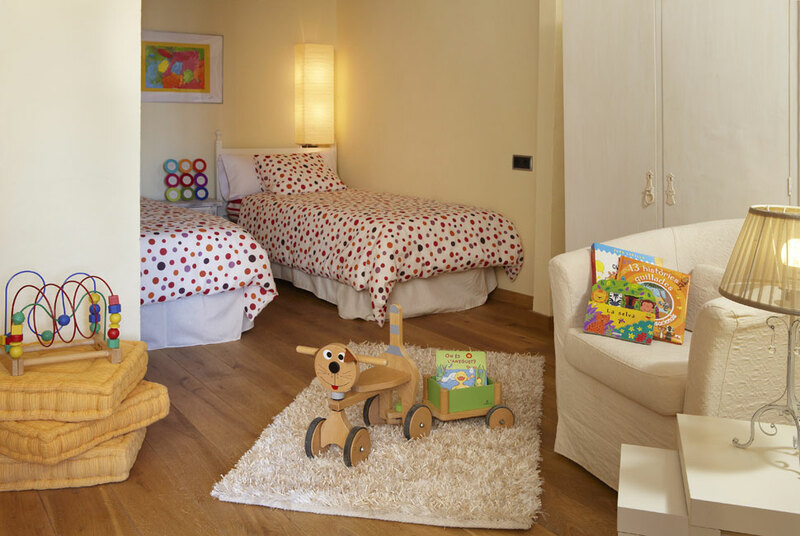 Spacious, welcoming and accommodating for adults and children alike. Suite Fonoll (Fennel Suite) has been decorated in a rustic, minimalist style. Its spacious en suite bathroom is a delightful combination of pale colours and wood, and boasts a traditional vaulted ceiling. 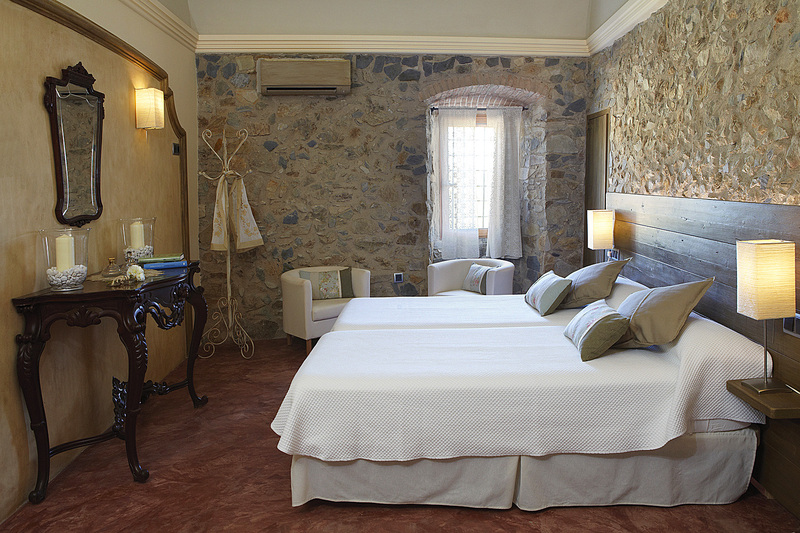 Suite Romaní (Rosemary Suite) combines light furnishings with traditional stone walling and a typical Catalan-style vaulted ceiling. The spacious ensuite bathroom boasts a modern wall-to-wall mirror that contrasts with the traditional stone work. Suite Ginesta (Broom Suite) contrasts pastel tones with rich, dark wood furniture and opens out onto a 30m² private terrace, the perfect place to enjoy the beautiful surroundings. Suite Horitzó (Horizon Suite) , elegant and refined, enjoys stunning panoramic views across green hillsides to the Mediterranean beyond. Suite Capelleta (Chapel Suite) is located in what is believed to have once been the Masia´s private chapel. Decorated in an elegant minimalist style and with wheelchair access, it is located on the ground floor with its own private entrance (via the main courtyard), which also makes it suitable for private staff: nannies, maids etc.